Let me tell you a story I like to call, "The best worst job interview ever". I had just come back from 2 weeks in Europe. I'm terrible jetlagged. I want to cancel my job interview, but I decide to drag myself to it. My plan is to slip out of work to the interview during my lunch hour without anyone noticing. Should be easy right? It would have been, but my office decided to have an impromptu pizza party. So I had to say, "Sorry guys, I'm not going to eat free pizza" by lying that I had a chiropractor appointment. Pizza-less, I hopped onto the subway. But thanks to good ol' reliable Toronto subway delays, I arrived downtown already 5 minutes late for my interview. I dashed up to the 29th floor, only to find the name of a different company on the door. I called the interviewer and discovered that HR had actually given me the wrong address. The wrong address?? You have got to be kidding me. So there I was, dashing from building to building in heels, trying to find the right "tall black building" that people were trying to direct me to. Have you seen Toronto? It's not exactly easy. Finally, now half an hour late, I breathlessly arrived at the right office. "I said I wanted to make a lasting impression, not a good one." After such a crazy experience, at least I can say that I have a new job! Haven't started yet, but I'm pretty pumped. Oh, I also got a little lesson in karma. Remember how I lied and said that I had a chiropractor appointment to get out of work? Well while running in heels, I messed up my hip and really did need a chiropractor to stop the pain. And that kids, is why you shouldn't lie. Worst job interview to have ended in the best possible way? 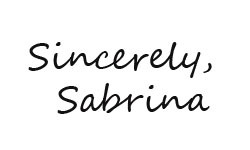 Haha, congrats on the new job, Sabrina! And it would've taken me a lot of willpower to turn down free pizza -- salute to you! Congrats on your new job! I hate those stressful moments, made worse when in heels! Love this outfit though, and the touch of green looks great on you! Good luck in the new job! To funny but you got the job! 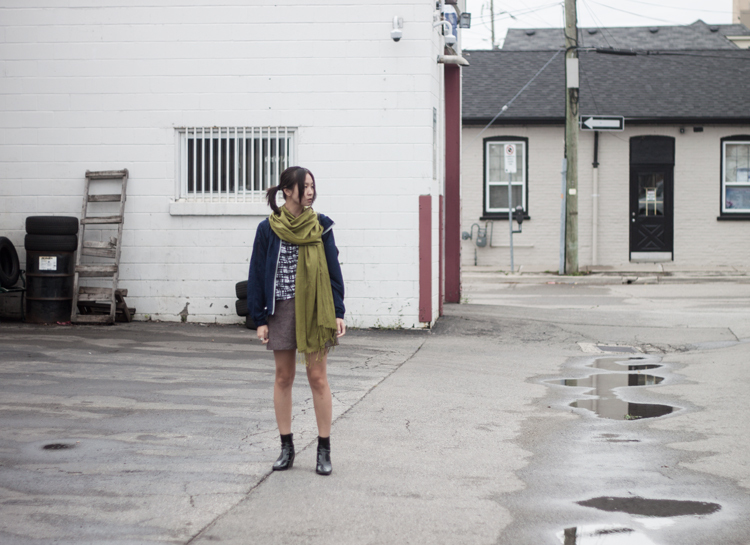 Love this green scarf! Well I am glad with all that trouble you at least got the job! 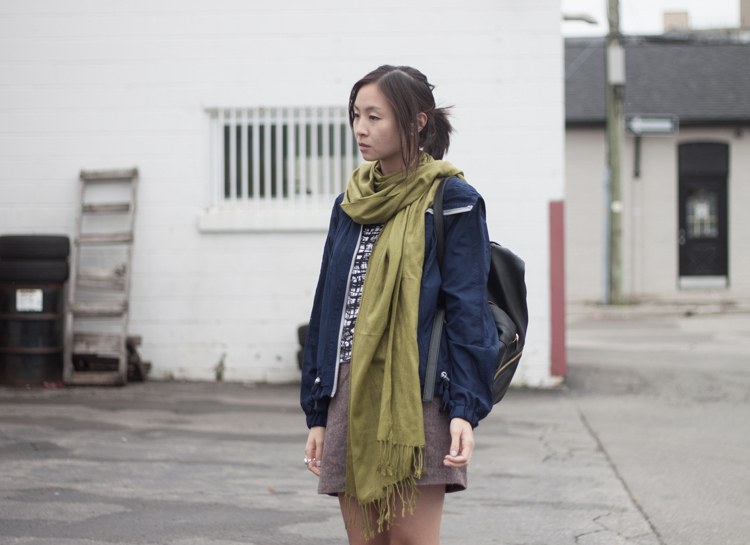 Really cute fall outfit perfect for a bit of a rainy or overcast day. Sorry to hear about your jet lag And that is incredible that you got the job despite being late! You really must have made an incredibly positive impression! Go you! You look wonderful. I love your beautiful scarf. I hope your job interview went well. This is a really great casual/laid back outfit that just has the cool vibe about it! That is too funny! I'm so glad you got the job! Your outfit is beautiful! 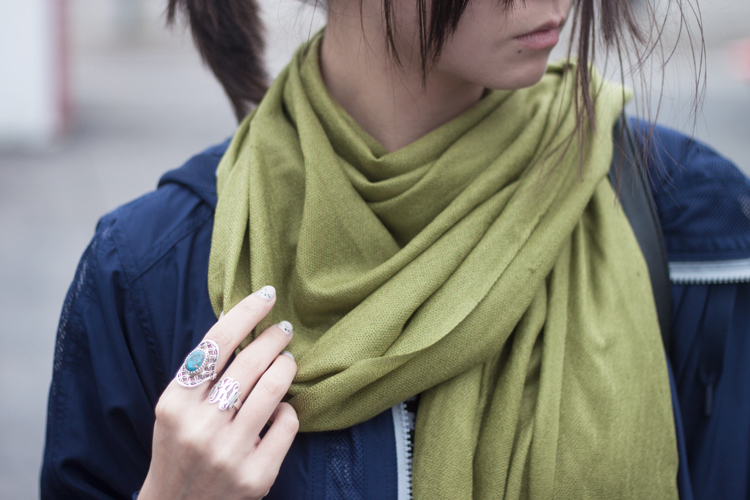 Lovely outfit : ) Your scarf and your ring are beautiful! Oh my goodness, well congrats on the new job! Your scarf adds the perfect pop of color! I loved reading this post. I'm so glad you got the job after all that. I love your green scarf. Have a wonderful day! Why so sad? Love the photos btw, looks really professional. Clever and fun story, but sorry about your hip! I am glad you got he job, and I am sure it is well deserved. Love your look, it is uber cool, the colors are wonderful and the vibe is so nice. Olive, navy, taupe, sage, white === love.